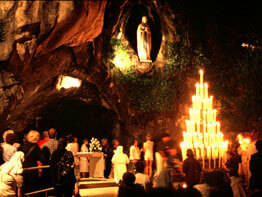 VATICAN CITY – To mark the 150th anniversary of Mary’s appearance to St. Bernadette Soubirous near Lourdes, France, Pope Benedict XVI authorized a special indulgence to encourage renewed holiness. VATICAN CITY – The supreme knight of the Knights of Columbus and the fraternal order’s bishop-chaplain met privately with Pope Benedict XVI Dec. 6 and delivered a check for $1.6 million. Three years from now, St. Agnes HealthCare in Baltimore will look completely different. Today, the biggest visible change is the loop road that’s been started; it eventually will provide access to a new 120-bed patient tower.